Stuart P. O’Neil: Bio & Choral Music | Santa Barbara Music Publishing, Inc.
Stuart P. O’Neil (b. 1969) has taught vocal and instrumental music for Kansas public schools since 1993. He received a bachelor of music education degree from the University of Nebraska and a master of music theory degree from the University of Kansas. 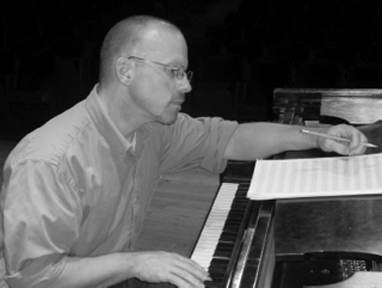 In addition to his work as a teacher and composer, Mr. O’Neil also serves as an arranger, accompanist, adjudicator, and conductor. He currently lives in Lawrence, KS, with his family. Stuart P. O’Neil has 4 titles published with Santa Barbara.